See Egypt in a new way at the Sheraton Cairo Hotel, Towers and Casino. Sitting on the west bank of the River Nile in unique adjoining towers, our hotel proudly stands tall as one of Cairo's greatest landmarks. Sheraton hotel places you in the middle of it all. Try your luck at Blackjack or the slots in our dazzling casino or take a short walk to the Cairo Opera House, Egyptian Museum, or Cairo shopping centers. The Pyramids of Giza are just 20 minutes away. Whether you traveled to Cairo by train (our hotel is 15 minutes from the railway station) or plane (we’re 30 minutes from Cairo International Airport), our friendly staff will greet you with a warm smile and help you make the most of your stay. Find magnificent views of the city or the River Nile from our 650 deluxe rooms, including 113 suites. Amazingly spacious, our deluxe rooms offer 100% Egyptian cotton linen for your added comfort. Enjoy a stay you will never forget at the Sheraton Cairo Hotel, Towers and Casino. 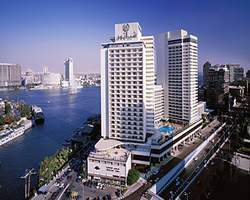 Sheraton Cairo Hotel 650 deluxe rooms, including 113 suites and five non-smoking floors, offer magnificent views of the city or the River Nile. Amazingly spacious, our deluxe rooms are as comfortable as they are luxurious. All beds offer 100% Egyptian cotton linen for your added comfort. While spending a sunny day by the pool, you can also enjoy a refreshing drink and a mouth-watering snack from Sheraton Hotel Pool. And when night falls, your dining options open even more. Aladdin, Sheraton Hotel Lebanese restaurant serves delicious oriental dishes. Sapporo Teppanyaki, boasts the city's best sushi and teppanyaki. La Mamma, an Italian Restaurant is a piece of Italy in the heart of Cairo. The exclusive and luxurious atmosphere of our unique Tower's Lounge pampers guests with snacks and refreshments all day in a cozy and elegant setting. Additional services include a fully equipped Business Center, 24-hour limo service, and a beauty salon. Recreational facilities are endless. Xanadu, our health club is the best place to work out and enjoy our rejuvenating Spa facilities. Enjoy a dazzling day by "Le Mirage" our outdoor swimming pool. Have a delicious meal. Enjoy the hot sunny days. Pamper yourself. Relax. Unwind.